What is 3D Rigging For Animation & Character Design? Rigging is a technique used in skeletal animation for representing a 3D character model using a series of interconnected digital bones. Specifically, rigging refers to the process of creating the bone structure of a 3D model. This bone structure is used to manipulate the 3D model like a puppet for animation. Pretty much anything can be rigged. A space ship, a soldier, a galaxy, a door, it doesn’t make any difference what the object is. Adding bones will allow any object to be animated freely. Rigging is most common in animated characters for games and movies. This technique simplifies the animation process and improves production efficiency. Once rigged with skeletal bones, any 3D object can be controlled and distorted as needed. In the entertainment industry rigging is a major step in the standard way of animating characters. Achieving smooth and complex animations is entirely dependent on the quality of the rigging phase in the animation pipeline. Rigging is one part of the larger animation process. After a 3D model has been created, a series of bones is constructed representing the skeletal structure. For instance, in a character there may be a group of back bones, a spine, and head bones. These bones can be transformed using digital animation software meaning their position, rotation, and scale can be changed. By recording these aspects of the bones along a timeline(using a process called keyframing) animations can be recorded. A basic setup may take a few hours or less while a complex rig for a movie could take days. The rigging process results in a hierarchal structure where each bone is in a parent/child relationship with the bones it connects to. This simplifies the animation process as a whole. When an artist moves a shoulder bone, the forearm and hand bones will move too. The goal is to mimic real life as accurately as possible. How the 3D model interacts with the bones is determined by a weight scale. The weight controls how much influence a bone has over a section of the mesh. In this way, the sensitivity of the deformation can be fine-tuned for precise animation. Weight painting is an integral part of the rigging process. The computer is often capable of automatically weight painting the model, but the result is sometimes lackluster. To get great animations it’s important to fine tune the weight of each bone. Because some characters share the same skeletal structures, entire rigs can be copied and assigned to a new mesh. Animations can be copied in this way as well making it easy to produce models with similar designs. Placing the bones is the easiest part of rigging a model. Once placed, many bones will need additional work to be animated properly. Rigging a character usually requires the artist to add Inverse Kinematics to their bones. This will reverse the default Forward Kinematics properties of the bones. Inverse Kinematics is used mostly for arms and legs, or other extremities like a dragon’s tail. A good IK setup will keep elbows and knees pointing in the right direction and allow an animator to achieve realistic motion more easily. Constraints are another essential element to any decent rig. To create smooth animations, some bones need to have restrictions applied to their movement. For example a bone may be allowed to move in one direction only. 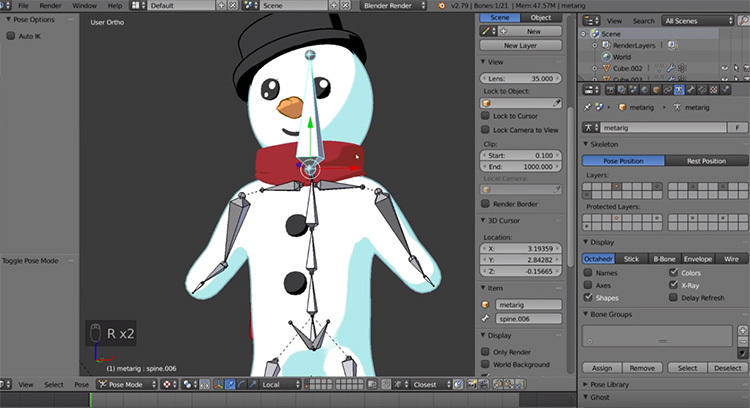 Rigging is a common technique for animating characters in video games, TV shows, and movies. Mechanical objects such as springs and doors can also be animated using skeletal animation once a rig has been assigned to a 3D model. Simulations can be run on all skeletal structures too. The computer will apply physics to the bones in the rig and record the outcome over a series of frames. This is great for ragdoll physics and virtual stunts. These virtual anatomy simulations are also useful outside of the arts and entertainment industry. For instance, the medical and education industries often need to create visuals for teaching or demonstrations. Complex rigs are often necessary for quality facial animations too. Creating a satisfactory facial rig requires a separate project from the rig of the character’s body. It’s often best to use techniques outside of the traditional bone structure when rigging a face, such as morph targets or blend shapes. The advantage of rigging is that it grants you easy control over the deformation of the model, making it relatively simple to animate a character. The disadvantage of this technique is that it doesn’t work well for animating surface details and it can take a very long time for complex projects. Most 3D animation packages come with a solution for rigging your models. Maya, 3ds Max, Blender, Cinema4D, and Houdini all contain Skeletal Animation functionality. Many programs also have support for motion capturing techniques that can be applied to rigs. This leads to faster development and greater realism in the final project. 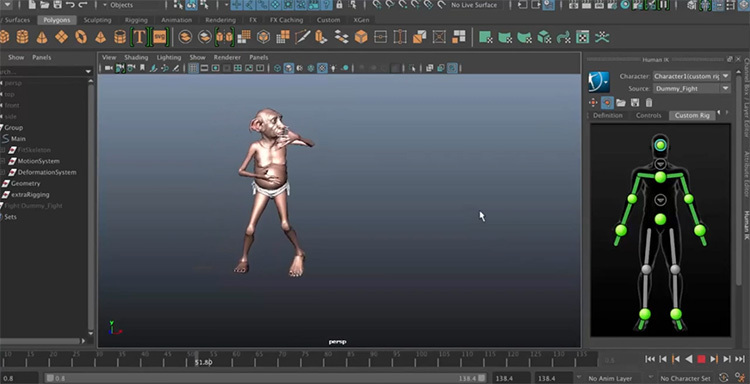 Moka Studio has developed new technology for controlling rigged characters in real time. 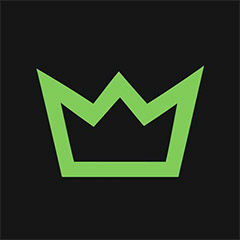 They aim to use this tool to make digital worlds more interactive and personal. Most game development and movie studios are using Maya or 3ds Max to rig and animate their models. These programs are industry standards for 3D animation. Blender is another popular option that’s also totally free. This open source 3D production package has everything necessary for rigging and animating models, although not quite as powerful as something like Maya. Once you export a project from any software listed above, the 3D animated files can easily be imported into game engines and other applications. The most common file type for animated scenes is .fbx. 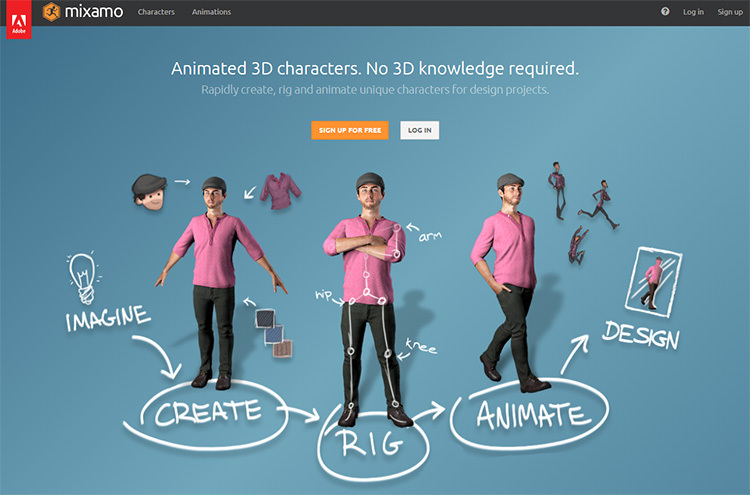 If you’re completely new to 3D animation you might want to consider Mixamo. It automates the rigging and weight painting process so you can quickly see your model in action. Additionally Mixamo provides default animations that can be customized to create more original character motions. Another program you might check out is MakeHuman which is perfect for creating generic humanoid characters. It can generate a wide range of figures using customized controls for properties like height, weight, and color. Once the model has been finalized MakeHuman can also rig the model for you. Professionals often combine techniques and combine programs depending on the job at hand. All 3D programs have strengths and weaknesses. Fortunately rigging and animation follow a similar workflow in most 3D software packages so you really can’t go wrong with any of the big programs.